Renovation & Face Lifting of B&S Lab Psycho Lab and GE Lab. (i) Maintenance and horticulture work of Eco park, Nature Trail & park of RDSO Colony. (ii) maintenance of Lawn & Hedge including other horticulture work in Sector C of RDSO Colony. (i)Construction of New Technical Meeting hall in RDSO Manaknagar Lucknow (ii)Develoment of Surrounding area, face lifting, provision of stair case in officers club. (iv) Improvement of damage drain, Boundary wall, path way etc from Langra Phatak to ORH. Auction for shop no. 16, 18, 19 & 20 in RDSO shopping complex. 226. WKS/Tree Auction/2009/Part-II Tree in the RDSO standard in the city premises Due to dry mature green-tilted hazardous 08.03.2019 10.04.2019 at 11:00 hrs. Provision of Auto Chlorinator at Pump Houses. (i)Construction of New Technical Meeting hall in RDSO Manaknagar Lucknow. Face Lifting and Up gradation of Signal Lab & Air Break Lab. Repairing of existing damaged flooring of RUB dewatering concrete. Civil work in connection with:- (i) Extension of skyway from existing FOB to Annexe-I (ii) Provision of Air- conditioning in book section of central library in Annex-I building at RDSO (iii) Replacement of roofing sheet of shed No.2 (Berthing complex of testing Directorate) including other civil work. RDSO colony, Office Complex and service Buiiding at RDSO Lucknow. 177. 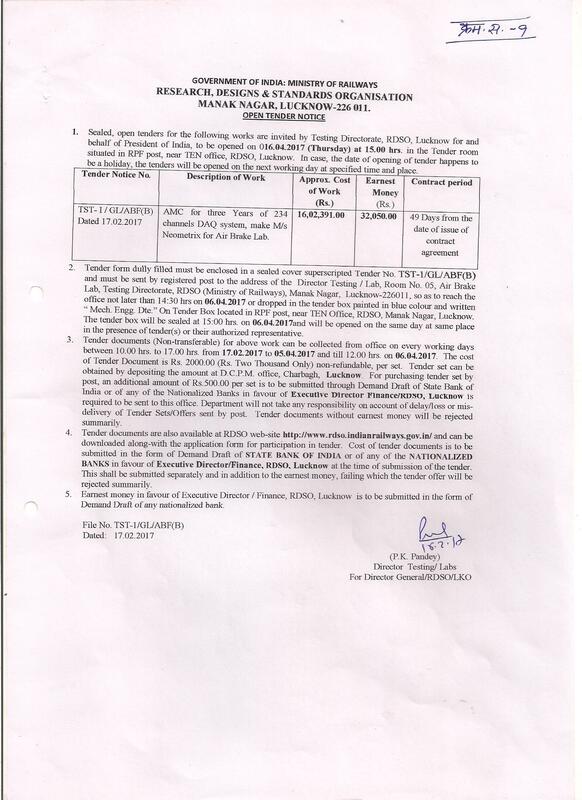 WKS-1319-TEN I) Civil work in connection with Provision of Air conditioning system in TMM Directorate. 2.Providing Consultancy services for conducting water audit and water conservation report to R.D.S.O. Colony and campus. II and III quarters Phase- I( in one Room). balance back Lane in the colony. Sector A of RDSO Colony. provide staff amenities in Lake Park. shutter in type III quarters. Open auction of shop No. 18 of shopping complex in RDSO Campus. (ii)Provision of wire gauge door shutter in type II quarters. (i) Heavy repairing work in toilets of KVS RDSO Lucknow. (ii)Repair & maintenance of officers club. Modification of Software (one time) and Calibration & Servicing of Impact Attenuation Test Apparatus of Rubber & Plastics Lab /M&C Dte. for 05 years as per Technical specification, tender conditions, etc. 2.Provision of Air-conditioning in Track Dte. unit at Ground Floor, Hall No.6 (Admin. Bldg.) of Track Dte. at RDSO. 3. Provision of Air-conditioning of RPF post at RDSO. Providing House Keeping service in the Officers Rest House & Sub-ordinate rest House at Shivaji Bridge, New Delhi. Tender cancellation due to administrative reasons. Improvement Work in Engine Development Directorate. Road repairing in RDSO Complex. 1. Provision of 2nd passenger Lift Admin. Bldg. of RDSO, Manak Nagar, Lucknow. 2. Comprehensive Maintenance services for one no. proposed Lift to be installed at Admin. Building of RDSO, Manak Nagar, Lucknow for Five years. 1. Provision of LED type Glowsing boards in different service buildings at RDSO. 2. Provision of (2’x2’) LED light fittings against replacement of 2x36W (2’x2’) CFL fittings at various locations of service buildings in RDSO. 1. Electrication work for re- wiring of Officer’s club, Manoranjan club & Sub-ordinate rest house in RDSO. 2. Provision of energy efficient LED street light fittings in RDSO campus by replacing MH light fittings in phased manner. 18/2017-18 Operation and comperhensive maintenance of Submersible Pump Sets, installed at various pump houses & Sewerage pump House in RDSO Manak Nagar Lucknow for Three years. 17/2017-18 Operation and comperhensive maintenance of 200 KVA, 250 KVA and 320 KVA DG set installed at various locations of RDSO, Manak Nagar Lucknow for 03 years. 119. 15/2017-18 1.Provision of 136 nos. of Scooter /Motorcycle garage in type III quarters for first floor in RDSO colony. 1. Provision of 2nd passenger Lift in Admin. Bldg. of RDSO, Manak Nagar, Lucknow. Lift to be installed at Admin. 117. 14/2017-18 1. Testing of Relay of LT & HT breaker in various sub-station of RDSO, Manak nagar, Lucknow. 2. Electrical work for provision of ladies changing room in RPF Thana at RDSO. 3. Provision of Electrification work for additional toilet in type-III quarters in RDSO colony. 4. Provision of Modulation / Extension of Officer’s Rest House at RDSO. Electrification of Garage in 115 nos. of Type IV Residential Quarters at RDSO Colony, Manak Nagar, Lucknow. Outsourcing of Seven Nursing Staff and One Dental Hygienist for Extra Divisional Hospital, RDSO, Lucknow” for One Year. Outsourcing of Casuality & ICU Cleaning for Extra Divisional Hospital, RDSO, Lucknow” for Two Years. 1. Provision of additional street lights along with poles in existing arrangements to improve street lighting. 2. Improvement of street lighting by provision of Solar LED street light with low height steel tubular pole at various locations in RDSO campus. Re-wiring of 532 nos. of residential quarters (different types) & strengthening of service line including modification of stair case light in RDSO colony. ii) Two Nos. of INNOVA/TAVERA (AC) or same segment vehicle (UV-2) of any company. (i) Provision of Rain water harvesting to recharge the ground water in RDSO (Phase-II). (i) Repairing works in Swimming pool (ii) Civil work for Provision of Air- Conditioning in Design halls & other locations of Wagon Directorate (iii) Civil work for provision for segregation of 11 KV power power supply system (Colony & DEDO feeder) in RDSO Lucknow. Rendering services for maintenance of RDSO Colony, Office complex and Service building etc at RDSO Lucknow. Comprehensive maintenance of 04x7.5 TR (Voltas make) Split AC units installed at Committee room of RDSO, Manak Nagar, Lucknow for three years. 87. 26/2016-17 A. Electrification of Collection & Treatment of Waste Water for Re-use in Garden‟s of RDSO, Lucknow. B. Provision of Air-conditioning & Electrification Work in Carriage Directorate. 75. 18-2016-17 A. Provision of 136 nos. of Scooter /Motorcycle garage in type III quarters for first floor in RDSO colony. Dte. in Admin. Bldg. at RDSO..
of different location in RDSO, Manak Nagar, Lucknow. C. Repairing of High Mast assembly at Signal lab. Provision of Air-conditioning in Electrical Dte. & T/L Hall in Annexe-I building at RDSO. iii) One No. of Toyota Innova (nonAC) or same segment vehicle (UV-2) of any company. 49 WKS-1226-TEN i) Provision of Air Conditioning in design halls other locations of Wagon Directorate. minor and major repairs, etc. Hiring of two ambulances with hooter equipped with all facilities viz. Driver, stretcher, stretcher bearers, medical oxygen cylinder, First Aid Box etc. for round the clock ambulance services at Extra Divisional Hospital, R.D.S.O.Lucknow. 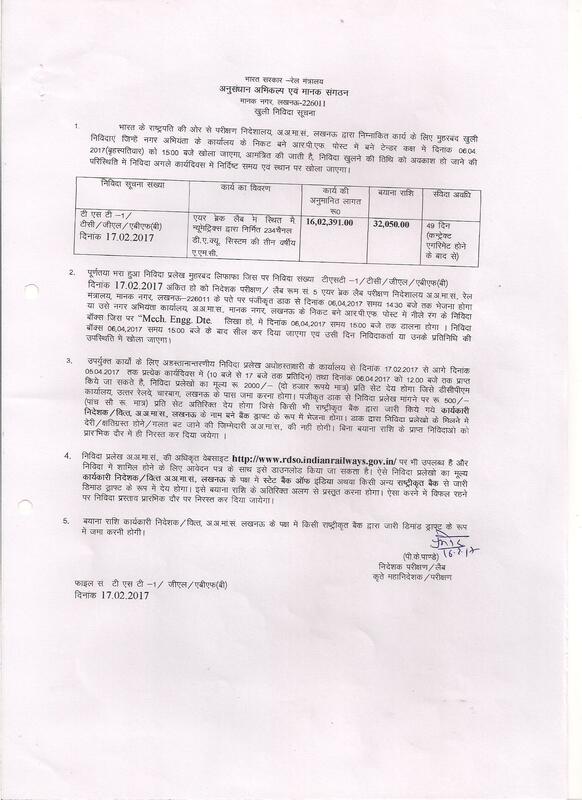 Provision of Air-conditioning in Design Halls and other locations of Wagon Directorate..
(S&T),RDSO, New Delhi on call basis. cell (S&T),RDSO, New Delhi on daily basis. i) Provision of pipe line connection from RCC over head Tank of STP to various parks of RDSO to supply recycled water from STP. (ii) Renewal of Water supply pipe line in RDSO Colony ( Phase-I). 24 Tender notice no. 01/FM/2015-16 Annual maintenance contract of 02 testing equipments, Universal Fatigue Testing Machine of capacity 50KN and 500 KN in for a period of three years in Fracture Mechanics section of M&C Dte./RDSO as per Technical Specification, tender conditions etc.